The New York members of the Noank Aquaculture Cooperative have been collecting proceeds from the sale of their Peconic Pearls oysters and farm tours to fund the Peconic Pearls Environmental Program. The funds are held by the Peconic Land Trust in a dedicated fund for projects that benefit the Peconic Estuary. The “Peconics” is an EPA estuary of national significance. In the mid-1980’s the estuary was plagued by the “Brown Tide”, a microalgae that turned the waters brown and opaque. The bloom was responsible for the loss of the productive bay scallop fishery and the decline of most finfish and shellfish populations. Restoration efforts in the years since have been fruitful. The bay scallop fishery is recovering, but Harmful Algae Blooms (HAB’s) are still a problem. The funds collected by the Cooperative are intended to fund research, education and land preservation projects that will serve to protect and restore this special ecosystem. 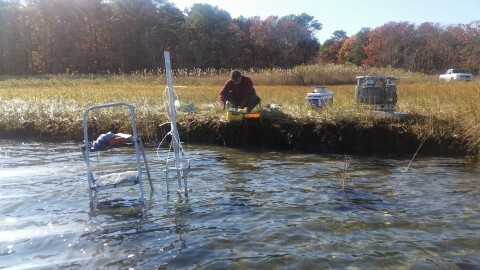 Locating and Quantifying Groundwater Derived Nitrogen Seeping into Surface Waters in the Peconic Estuary; Demonstration of the Trident and UltraSeep Technologies. In December of 2014 the Cooperative members had collected enough funding through the sale of their Peconic Pearls oysters, tours and individual donations to fund the first Peconic Pearls project. The National Grid Foundation generously matched the funds raised by the co-op members. This allowed us to fund a project with Cornell Cooperative Extension of Suffolk County Marine Program, which has patented technology that can find the location of groundwater seeping into the bay. The equipment can also be used to monitor the flow of the groundwater and sample it for water chemistry purposes. Until now, no one had been sampling the groundwater where it enters the bay to determine both the concentration of nitrogen and the flow rate of the groundwater. This unique technology was used to determine where the groundwater was entering the bay at three different sites throughout the Peconic Estuary. Then, a specialized funnel-like device was deployed offshore and left for a complete tidal cycle to take water samples and measure the flow of fresh water as it entered the bay. The results of the study will be released in the Summer of 2015. Through the study, the hope is to determine the rate at which nitrogen is entering the bay at various sites and determine which areas contribute the most pollution from groundwater. These could be the areas we first concentrate on when working to reduce the impact of land use on the estuary. This technology, if proven successful in this application, could be used in all of our estuaries to determine where the hot spots are for groundwater impacts on our surface waters.